Success is all about tapping the power you already have. Habits are the key. We’ve learnt a lot about habits over the past ten years – through advances in psychology and neuro-science and what have you. In that way, this is an amazing time to be alive. They say something like 40% of our decisions are made on habit. How many times today have you said, “Let me stop and think about that for a sec…”? So a huge part of our day is being run on auto-pilot – on habit. But most of us never sit down and program our auto-pilot consciously. We just let it pick up whatever traits and quirks it does over the course of a life time, and let it play out whatever life strategies worked for us when we were 6 years old. To me this is some of the lowest hanging fruit there is. And thankfully, thanks to recent advances, we now have a pretty good idea of how we can ‘hack’ our autopilot, and rewire our habits. Last week I showed you how habits live in the more primitive, ‘animalistic’ parts of the brain, and how that means you can’t change them through reason and logic. You need to train them. You need to become your own lion-tamer. And while reason and logic won’t work, there are tools that do. Now each habit is different. Each one is driven by a different craving and it serves a different need. But it is possible to lay out a framework for understanding how all habits work, and how to change them. So, soldering irons ready? Let’s hack your autopilot. Ok, I’ll step through each of these in turn, but there are 5 steps you need to know. I’ll use the example of an afternoon doughnut to show what I’m talking about – but habits extend in to all aspects of our lives – whether that means the way we lock up when presented with an unfamiliar situation, or the way we sabotage endeavours that take us into risky territory. This stuff goes deep. Researchers have shown that there is a simple habit loop behind every habit. There is the cue, which sets up the craving. There is the behaviour itself. Then there is the reward that comes with that behaviour. If we’re thinking about habits, we need to think about the entire loop. We can’t think about the behaviour – or the routine – in isolation. But if we want to pick it apart, then thinking about the routine in isolation actually is the first place to start. What is the behaviour you want to change? Let’s say it’s having a doughnut in between lunch and dinner. That’s an easy one to identify. For the deeper, more complex habits, we might have to do a little more digging. But once we’re clear on exactly what the routine is, we have our target. We have the behaviour we’re trying to change. The key to remember is that all routines have a pay-off. They might create collateral damage – like putting on weight – but there is an end that every habit serves. We just need to find out what it is. That might be easier said than done. Take the doughnut example. Maybe the reward is the sugary high. It probably is. But it could also be the distraction from work. Or it could be the opportunity to socialise at the doughnut shop. If we’re going to change a habit then we need to know for sure, but the only way to know for sure is to experiment. So when the craving for the doughnut kicks in, run your routine, but alter it up slightly. Maybe one day you get up and just go for a walk and get away from your computer. Maybe you just go and gossip and the shop, but not buy anything. Maybe you get a wholesome sandwich. Maybe you get something else sugary, like a chocolate bar. One of these rewards, and only one, will satisfy your craving. The others will not. Once you’ve figured out exactly what’s driving your craving, you’ve got two thirds of the puzzle figured out. The next stage then is to figure out what triggers the craving. What is the cue? It is going to be one of these things that is triggering your habit. Armed with this knowledge, it’s easy to isolate your cue. Get a notebook (you know I’ve got a fetish for them) and make a note each day what’s happening on these 5 fronts when your craving hits. Very quickly, a pattern will emerge. So say, you might think that you’re eating doughnuts because you’re hungry. But then you might notice that you always crave doughnuts just after your nightmare boss sends out his daily update. It might actually be a comfort thing. Now that you’ve got the routine, the reward and the cue precisely identified, you’ve got the blue-prints to your habit. Now it’s time for a reno. The thing to remember is that you can’t destroy a habit (alcoholics are always alcoholics). You can only re-engineer them. And the golden rule here is to swap out the routine in our habit loop. The cue and the reward must stay the same. So we must develop a new habit loop that crowds out the old one, and replaces the routine with something more productive. Write it out and stick to it as best you can. Train yourself to reach for a new routine when the craving hits, and take time to enjoy the reward. In time, the animal that drives your habits will learn, and the new routine will become automatic. That is, it will require no will-power at all. From that point on, it’s no doughnuts, no worries. I know that when I’m talking about doughnuts, it can all sound a bit trivial and silly. But often when we’re dealing with habits we’re dealing with some deeply engrained and painful things. The cravings that come with addiction. The feelings of isolation and abandonment that can drive eating disorders. This stuff can be huge. And so, if you can, rope in some one to support your journey. Just tell them the habit you’re trying to rewire, and your strategy for how you’re going to do it. Keep them updated on your progress. Like most of life’s difficult journeys, it’s easier when you’ve got someone you can call when things get rough. We’re talking about changing habits here, but the power of the habit loop framework is that it helps us understand how to build new habits as well. So say you want to get up early and listen to one of my fabulous podcasts. Set up a cue – say a 6:00 alarm. Set up a reward – a nice soak in a bath, or a small piece of chocolate. In time, the new routine will become automatic. And when I say automatic, it will require no will-power on your part. Your body will just wake you up and start you moving towards listening to the podcast. At the end of the day, the journey to success is largely about identifying unproductive habits, and replacing them with productive ones. It’s about gearing yourself to be automatically moving in the right direction when the moment strikes. There’s a lot of creativity and insight that this process requires. What craving is actually driving a habit? What end does it actually serve? But the key here is really self-awareness! You need to watch yourself, learn how you react in certain situations. You need to realise when your defences are triggered, your wounds are noodled with, or your insecurities poked at. And you need to watch and learn what strategies you instinctively go for in those situations. You need to get to know your animal a little better. Now you could write a book on how to build compassionate self-awareness. Well, I couldn’t. I don’t know where to start. It’s something that probably better done one on one anyway. But once you are watching and learning about yourself, that’s the first step in consciously shaping the person you are and the life you are living. And this powerful 5-step framework is an easy way to hack your hardware and make the changes you want. And if you want to go deep on this stuff, have a look at ‘The Power of Habit’, by business writer Charles Duhigg. Amazing book. I’m just scratching the surface here. But try it out. Pick a habit – just for fun – and try it out. I’d love to hear your results. 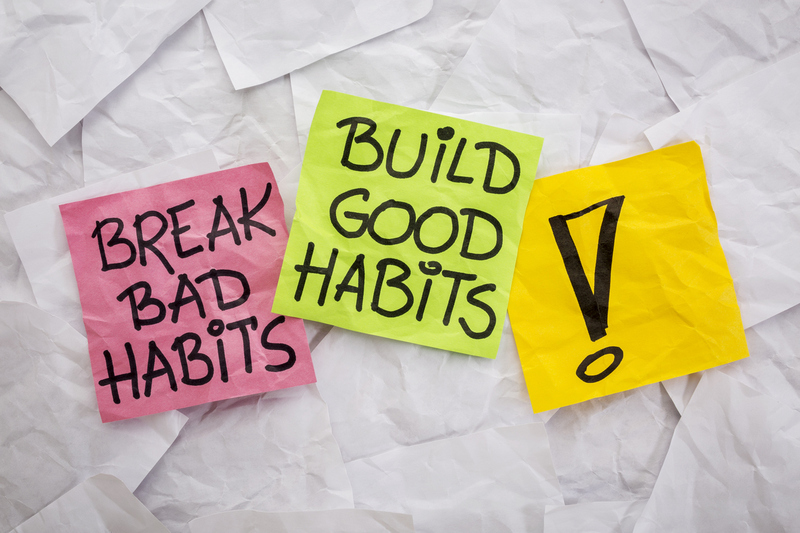 Ever had to rewire a habit? How did you do it?